The Swirlydoos Round Robin for June is all about the Dads in our lives and I've chosen to scrap this photo from Summer 1951 of my father with my sister Jean, my brother Jack and me (I'm the one facing the camera). I'm on Team 1 this month, following Rae Moses' and Kim Heard's gorgeous designs. Like Kim, I've selected some Blue Fern Studios papers from my stash - in this case several pages from the Love Story collection. I've copied Rae's punched layer using the Martha Stewart Cherish PAP set; however, I lack her patience and have not included her faux stitching. 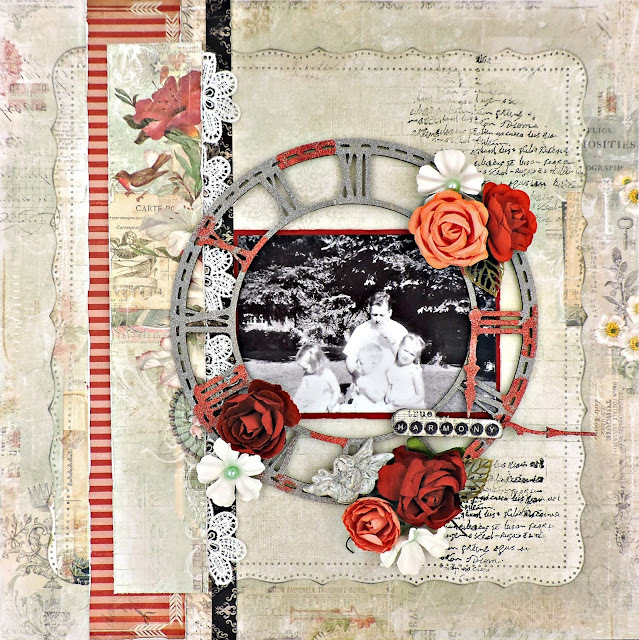 Also from my stash is the Blue Fern Roman Clock chipboard that I altered with Ranger Antiquities embossing powder in Cement and Chinese Red. The distressed strips down the side are the trimmings from my punched piece. I've also used some of that amazing Prima lace trim and I carried out the pearls by placing them in my flowers. Alas, I don't have anything as good as Kim's adorable cherub, but my Prima resin fairy seems to fit perfectly here.